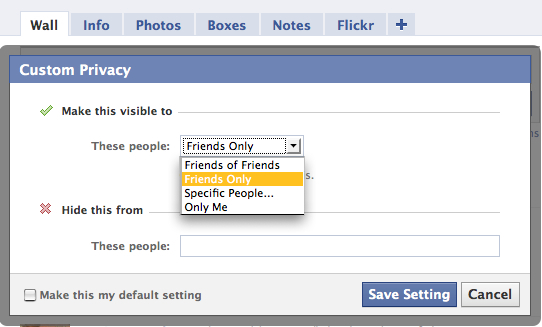 If you need to hide your pictures from a certain group of people, it’s easy to do so by using the ‘lists’ feature. How to do it, then? Nothing easier: click “Account” in the top right corner then click on edit friends”. Press ”Create a list” and add your friends there. Then, you will need to go to “Account” again, but this time click on “privacy settings”. Press “Custom”, then “Customize settings” and chose the items you want to hide. Next to it, there should be a ‘drop down menu”; click on that button and then, “Custom” once more. You should be done. The new slide-show photo viewer does not seem to have lots of fans. If you don’t like it either, get rid of it! Here’s one of the little Facebook secrets that many people would want to know: wait until the picture is loaded, then click “refresh” in your browser, or F5 on the keyboard. This is enough to get you to the old style photo viewer that you like (above). Whenever you install Facebook apps, you should bear in mind that they have access to all your private stuff. Moreover, apps you don’t use anymore can still track all your information. Click „Account”, then Privacy Settings and go to “Edit Your Settings” which is right under „Apps And Websites” on the privacy screen (bottom, left). Now, all you have to do is click “Edit Settings” in the right side of the “Apps You Use” section. See the grey little “x” next to the apps you don’t use anymore? That’s right, click on it and they will not have access to your private information any longer. The HTTP and the Login notification settings are some awesome Facebook secrets you may need. They will enhance your security features, if you allow them to do so. HTTP is great if you worry that your password might be stolen while logging into facebook on a public Wi-Fi. The Login notification will tell you, by means of an e-mail, if your account is accessed from an unrecognized device. Just go to your account settings to find them. If you did not know this, you can still download pictures easily, even though the picture browser in the slideshow format does not allow you to drag the pictures you want to save. Therefore, if you hate screen grabbing, then know that you may still download your pictures really fast by using the “download” button in the corner of the picture viewer. This easy trick may be of great help, and save you a lot of time, especially if you are not the type with lots of friends you never talk to. You just have to access your birthday page then look under the last birthday notification in order to find the “export birthdays” button. Here you are. Click the link and from now on, you will be able to receive notifications about your friends’ birthdays by using the default calendar application on your own PC. 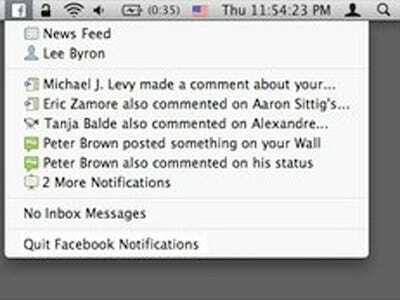 If you wish to be always up to date regarding your notifications, you should know that one of the “well kept” Facebook secrets is that it provides some cool features, both for Mac and for pc that allow you to do exactly that: If you own a Mac, then you may use the official desktop notifier especially conceived for it. A Facebook icon in your menu bar will turn blue whenever you get a new notification. If you have a pc, then the Facebook page maybe added to your taskbar, but only if you install Internet Explorer 9. A red asterisk will tell you that you got news. This is also easy: all you need to do so that your post appears on the walls of several friends, is to tag the chosen friends on a post, on your own, or on anyone else’s wall. Moreover, if you type @ and then the name of your friend when writing a post, then the friends you tagged will see it on their walls as if it was an ordinary wall post. Here is one of the Facebook secrets you really need to know: The new Groups feature allows you to see the updates of the members of your group, to edit documents with their help and to chat together in a private chat room. You may also easily exit the group by clicking the grey “X” which can be found right next to the group’s name in the navigation bar. I go on Facebook a lot, so the things that are in this article are really interesting to me. Great job! This is really great! I don’t go on Fb too much, but when I do, I want to enjoy myself. This article is just what I needed. Thnx a lot for sharing these secrets with us! I think that everyone here will use what they just read. I know I will.